Welcome to KC Booth. 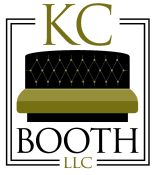 We have been proudly manufacturing the finest booth seating and upholstered furniture here in the heartland of the United States for over 60 years. No project is too complex or detailed. We treat every project with the same attention to detail to make sure we bring the image you have on paper and in your mind to reality.